Flanker Heinrich Brussow represents the Free State Cheetahs in the Super 14 and Currie Cup and has also won Test recognition with South Africa. In 2009 Brussow was part of the South African side that played against a Namibian XV in preparation for the British & Irish Lions tour, but did not make the original squad to face the Lions despite an outstanding Super 14. During the Lions' tour, Brussow played for his franchise against the touring side in a losing cause in Bloemfontein. His performance won high praise from Lions skipper Paul O'Connell and placed doubt over his omission from the Test setup given the damage that his ability at the breakdown had caused. After an injury to Schalk Burger, Brussow was called up to the Springboks squad for the first Test in Durban and played brilliantly, scoring a second-half try in a narrow 26-21 win. He was used as a replacement in the second Test once Burger returned to the side as the Springboks won the series. After Burger was sin-binned in the first minute of the second Test and handed an eight-week ban for making contact with Luke Fitzgerald's eyes, Brussow started the third Test as the Lions gained a consolation victory in Johannesburg. Brussow cemented his place in the squad during the Tri-Nations and was an intergral part of their successful campaign. He won the Man of the Match award for outplaying All Blacks skipper Richie McCaw during a 28-19 win in Bloemfontein and was subsequently named as SA Rugby Young Player of the Year. Brussow's first Test cap came as a replacement against England at Twickenham in an emphatic 42-6 victory in November 2008. But Brussow's run in the Springboks squad was cut short through injury. He missed the majority of the 2010 and 2011 Super Rugby season but made his comeback in the Currie Cup for the Free State Cheetahs. 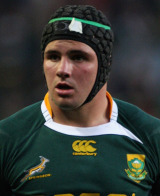 And Brussow was immediately thrown back into the Boks side for the 2011 Tri-Nations.